The contact center industry is changing considerably due to technology enablement. Contact center automation is rapidly becoming a priority as centers increasingly embrace technologies such as artificial intelligence (AI), chatbots, robotic process automation (RPA), and robotic desktop automation (RDA) to handle customer interactions on rote queries like account balances, package tracking, and reservation confirmations. A similar transformation is also taking place in personal transportation. Advancing technologies and intense competition are driving amazing strides in the autonomous vehicle industry. While cars aren’t yet 100 percent self-driving, companies like Tesla are already offering advanced driver assistance solutions that can pretty much take control of driving, albeit with human supervision. With the perceived nature of each of these two industries, it’s easy to assume that contact centers will be fully automated in far less time than the two to three years some believe it will take for autonomous driving solutions to get you from one point to another without human intervention. However, this is an incorrect assumption. Indeed, counter-intuitive as it seems, it’s much more difficult to completely automate contact centers than it is to automate driving. Why? Driving involves a large, but still finite, number of scenarios that need to be programmed for. But a contact center environment can throw up potentially infinite unique problem statements and challenges that enterprises cannot possibly predict and program for in advance. Yes, AI helps, but even that can only get you so far. At the end of the day, the human mind’s problem-solving ability far exceeds anything that the current or foreseeable technology can offer. And while most people would be more than happy to let robots take over the wheels on the road, they still expect and require human touch, expertise, and judgment for the more complex pieces that usually make or break the customer experience. Technology just isn’t sophisticated enough to handle these yet. 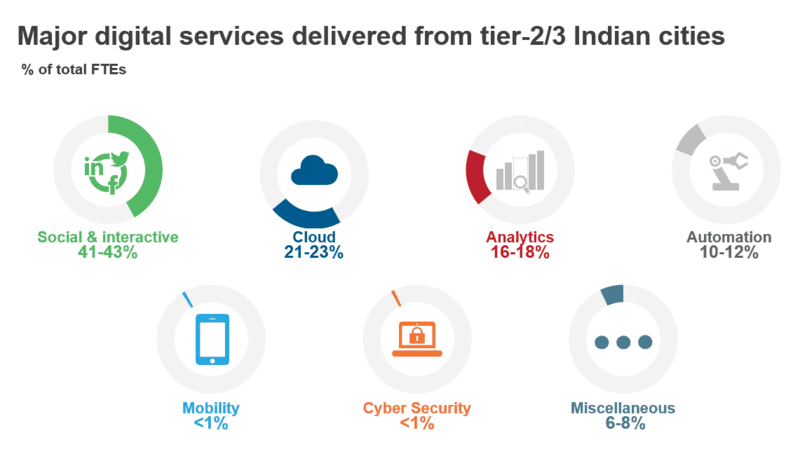 Although technology use in contact centers is in the early stages, we are already witnessing higher agent satisfaction and lower attrition rates in an industry that has one of the highest churns globally. And as robots increasingly take care of customers’ simple, straightforward asks, we certainly expect agents’ satisfaction to increase. Of course, agent profiles will continue to evolve as they are required to deal with more challenging and complex issues leveraging machine assistance. This will, in turn, demand greater investments into talent acquisition and upskilling programs. It will be interesting to see how all of this plays out in the next few years as technology becomes increasingly advanced and capable. The only thing we can say with certainty is that the customer experience of the future will be much more pleasant as irritations like long wait times, inept IVR responses, and repetitive conversations with agents who hold incomplete information become issues of the past…or, shall we say, smaller and smaller objects in our rearview mirrors? The process automation market is evolving in more ways than one. Many organizations are taking the next step of complementing Robotic Process Automation (RPA) with Artificial Intelligence (AI) solutions such as virtual agents and intelligent document capture. Others are looking deeper into their business functions with process mining and discovery software to scale automation and capture more returns from them. Process mining and discovery solutions automate a part of automation itself. This is effectively mining processes for elusive gold opportunities for automation. Process mining software has been around for a while and can be used for many purposes, but several vendors have made a name for themselves in the automation space, e.g., Celonis and Minit. These types of solutions use application logs to reconstruct a virtual view of processes. They discover business process flows and models, and provide process intelligence analytics. They can even suggest how to change a process using smart capabilities. 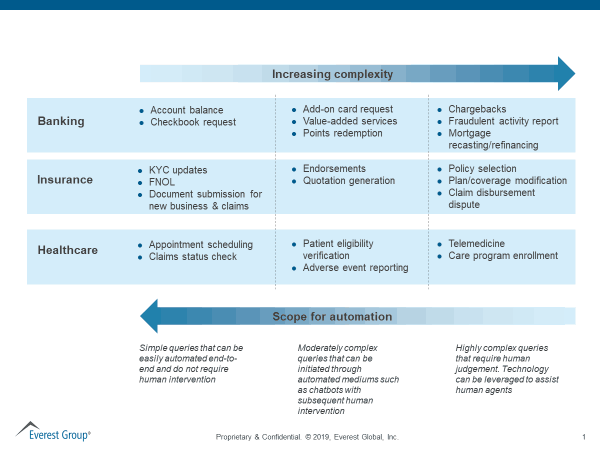 The result is information that allows organizations to decide what process to automate next. Some service providers have developed their own capabilities in this space as well. An example is Accenture, which uses process mining for automation as a competitive differentiator. Valuable as it is, however, process mining also has its drawbacks. For example, it requires a lot of data. And if you want to find opportunities among processes that go across enterprise systems, you need to integrate the logs from these systems, e.g., build a data warehouse. Those of you who have built data warehouses know what a massive pain this can be. While process miners can also do process discovery, several RPA vendors – including EdgeVerve, Kryon, and Nice – are offering new solutions. They’re using their desktop automation and action recording capabilities, complemented with AI, to capture and reconstruct what the human worker does, and then map and analyze the actions to identify opportunities for automation. Process discoverers do not require a load of application data, but they do come with their own challenges. For example, a recording may not capture the full set of relevant steps. And employees may have concerns around privacy. So, is it worth it to use process mining and discovering solutions despite their downsides and flaws? Yes, absolutely. But curb your enthusiasm, set expectations at the right level, and go for the art of the possible. For example, there are many opportunities for automation within individual applications, without having to include processes that go across systems. And, you can use human intelligence to manually fill in the gaps and augment the findings of an automation discovery tool, even though doing so is going out of fashion. With yet another category of software coming to the fore, enterprises would be right to feel that they are on a technology investment hamster wheel – there is no end to the cycle. After all, in recent years we have had the huge wave of RPA adoption. And today, in addition to competitive pressure to invest in AI-based automation, enterprises are having to evaluate process mining and discovery as well. The good news is that automation can generate significant returns on investment. Our research and interactions with enterprises have shown this to be the case time and again. Process mining is another piece of the jigsaw, and it can help you find more automation gold. Everest Group will be publishing a detailed viewpoint on process mining and discovery very soon. Be sure to keep an eye out for it, so you can mine it for gold. AI is certainly being used to attempt to solve many of the world’s big problems, such as health treatment, societal security, and the water shortage crisis. But Everest Group research suggests that 53 percent of enterprises do not – or are not able to – differentiate between AI and intelligent automation and what they can do to help them compete and grow. This trivialization of AI is both eye opening and frustrating. While it’s true that automation of back-office services is one strong case for AI adoption, there are many more that can deliver considerable value to enterprises. Examples we’ve researched and written about in the past year include intelligent architecture, front-to-back office transformation, talent strategies, and AI in SDLC. It’s been said that “audacious goals create progress.” So, how should enterprises think more creatively and aspirationally in their leverage of artificial intelligence to extract real value? There are three ingredients to success. Enterprises are experimenting with AI-driven IT infrastructure, applications, and business services to enhance the operational efficiency of their internal operations. We have extensively written about how AI-led automation can drive 10-20 percent more savings over traditional models. But enterprises have far more to gain by experimenting with AI to fundamentally transform the entire landscape, including product design customer experience, employee engagement, and stakeholder management. Most enterprises are confusing putting bots in their contact center with AI adoption. 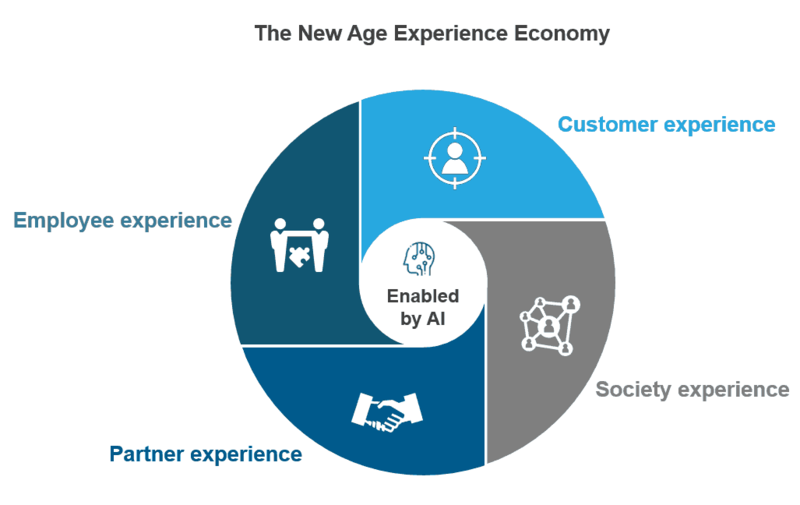 We discussed in an earlier post that enterprises need to get over their CX fixation and drive an ecosystem experience with AI at the core. Our research suggests that while 63 percent of enterprises rank CX improvement as one of their top three expectations of artificial intelligence, only 43 percent put newer business model among their top three. We believe there are two factors behind this discouraging lack of aspiration: market hype-driven reality checks (which are largely untrue), and enterprises’ inability to truly grasp the power of AI. While seemingly paradoxical, humans must be central to any AI adoption strategy. However, most enterprises believe bot adoption is core to their AI journey. 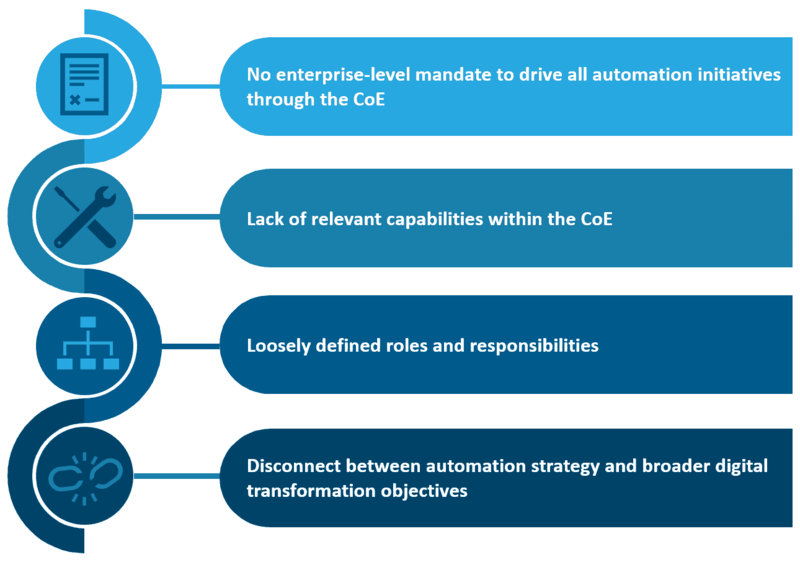 Even within the “botsphere,” they narrow it down to Robotic Process Automation (RPA), which is just one small part of the broader ecosystem. At the same time, our research shows that 65 percent of enterprises believe that AI will not materially impact their employment numbers, and that bodes well for their realization of the importance of human involvement. And, what do enterprises need to do? Our research suggests that 84 percent of enterprises believe AI initiatives have a long gestation period, which undoubtedly leads to the business losing interest. 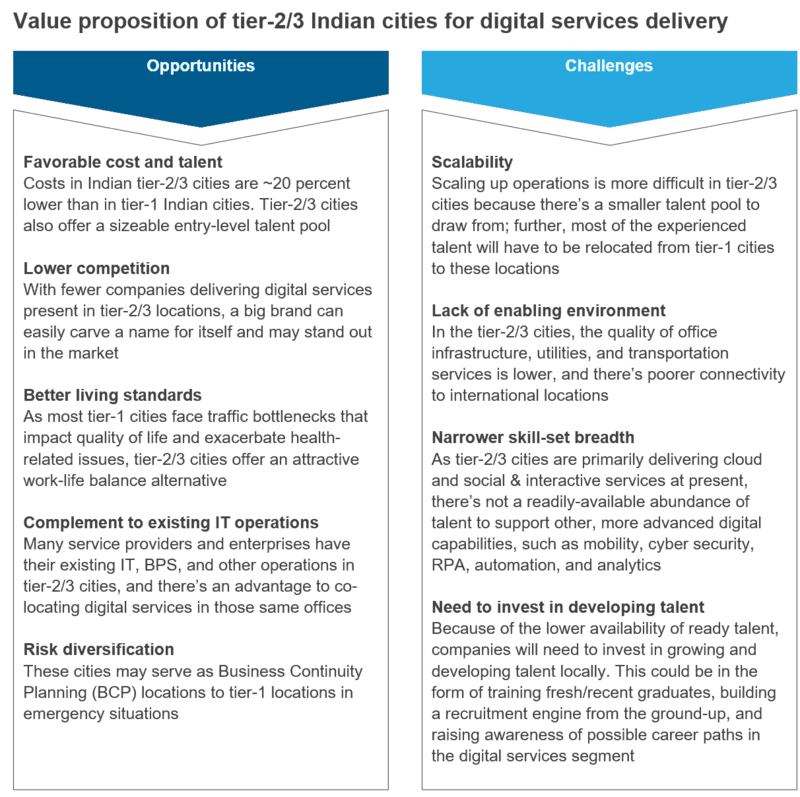 However, given the nature of these technologies, enterprises need to become more patient in their ROI expectation from such initiatives. Though agility to drive quick business impact is welcome, a short-sighted approach may straight jacket initiatives to the lowest hanging fruits, where immediate ROI outweighs longer term business transformation. Enterprises need AI champions within each working unit, in appropriate size alignment. These champions should be tech savvy people who understand where the AI market is going, and are able to contextualize the impact to their business. This team needs to have evangelization experts in who can talk the language of technology as well as business. Our research suggests that ~80 percent of enterprises believe their service partners lack the capabilities to truly leverage artificial intelligence for transformation. Most of the companies complained about the disconnect between the rapid development of AI technologies and the slowness of their service partners to adopt. Indeed, most of these partners sit on the fence waiting for the technologies to mature and become enterprise-grade. And by then, it is too late to help their clients gain first-mover advantage. As AI technologies span their wings across different facets of our lives, enterprises will have to become more aspirational and demanding. They need to ask their service partners tough questions around AI initiatives. These questions need to go far beyond leveraging AI for automating mundane human tasks, and should focus on fundamentally transforming the business and even creating newer business models. Let’s create audacious goals for artificial intelligence in enterprises. What has been your experience adopting AI beyond mundane automation? Please share with me at [email protected]. Everest Group’s digital services research indicates that 89 percent of enterprises consider customer experience (CX) to be their prime digital adoption driver. But we believe the digital experience needs to address all stakeholders an enterprise touches, not just its customers. We touched on this topic in our Digital Services – Annual Report 2018, which focuses on digital operating models. Indeed, SAP’s recent acquisition of Qualtrics and LinkedIn’s acquisition of Glint indicates the growing importance of managing not only CX, but also the digital experience of employees, partners, and the society at large. Given the deluge of data from all these stakeholders and the number of parameters that must be addressed to deliver a superior experience, AI will have to be the core engine powering this digital experience economy. It will allow enterprises to build engaging ecosystems that evolve, learn, implement continuous feedback, and make real time decisions. Today, most enterprises narrowly view the role of AI in CX as implementing chatbots for customer query resolution or building ML algorithms on top of existing applications to enable a basic level of intelligence. However, AI can be leveraged to deliver very powerful experiences including: predictive analytics to pre-empt behaviors; virtual agents that can respond to emotions; advanced conversational systems to drive human-like interactions with machines; and even to deliver completely new experiences by using AI in conjunction with other technologies such as AR/VR, IoT, etc. Digital natives are already demonstrating these capabilities. Netflix delivers hyper personalization by providing seemingly as many versions as its number of users. Amazon Go retail stores use AI, computer vision, and cameras to deliver a checkout free experience. And the start-up ecosystem is rampant with examples of cutting-edge innovations. For instance, HyperSurfaces is designing next-gen user experiences by using AI to transform any object to user interfaces. But focusing just on the customer experience is missing the point, and the opportunity. AI can, and should, play a central role in reimagining the employee journey to promote engagement, productivity, and safety. For example, software company Workday analyzes 60 data points to predict attrition risk. Humanyze enables enterprises to ascertain if a particular office layout supports teamwork. If meticulously designed and tested, AI algorithms can assist in employee hiring and performance management. With video analytics and advanced algorithms, AI systems can ensure worker safety; combined with automation, they can free up humans to work on more strategic tasks. Enterprises also need to include suppliers and other partners in their experience management strategy. Using predictive analytics to automate inventory replenishment, gauge supplier performance, and build channels for two-way feedback are just a few examples. AI will play a key role in designing systems that not only pre-empt behaviors/performance but also ensure automated course correction. Last but not least, enterprises cannot consider themselves islands in the environment in which they operate. They must realize that experience is as much about reality as about perception. Someone who has never engaged with an enterprise may have an “experience” perception about that organization. Some organizations’ use of AI is clearly for “social good.” Think smart cities, health monitoring, and disaster management systems. But even organizations that don’t have products or services that are “good” for society must view the general public as an important stakeholder. For example, employees at Google vetoed the company’s decision to engage with the Pentagon for use of ML algorithms for military applications. Similarly, employees at Microsoft raised concerns over the company’s involvement with Immigration and Customs Enforcement in the U.S. AI can be leveraged to predict any such moves by pre-empting the impact that a company’s initiatives might have on society at large. As organizations make the transition to an AI-enabled stakeholder experience, they must bear in mind that a piecemeal approach will not work. This futuristic vision will have to be supported by an enterprise-wide commitment, rigorous and meticulous preparation of data, ongoing monitoring of algorithms, and significant investment. They will have to cover a lot of ground in reimagining the application and infrastructure architecture to make this vision a distinctive reality. What has been your experience leveraging AI for different stakeholders’ experiences? Please share with us at [email protected] and [email protected].